As your personal Health Coach, I will guide you to find the food and lifestyle choices that best support you, and I will also help you to make gradual, lifelong changes that enable you to reach your current and future health goals. If that sounds like what you’re looking for, contact me for a free health breakthrough session. See how holistic health coaching can help you stay on track with your health goals. PS: If you’re still not sure what exactly a Health Coach is, to help you better understand, I’ve summarized it here. I was very discouraged because I had been gaining weight and nothing I did to lose the pounds seemed to be working. I reached out to my doctor, but that offered no help. When I began working with Lauren, I thought it would just be about nutrition, but I was wrong. She provided a holistic approach to all aspects of my life. With Lauren’s help, I now have a more positive outlook and have made a huge change in my eating habits without feeling deprived. Most importantly, I feel so much better. I am so thankful that I met Lauren. 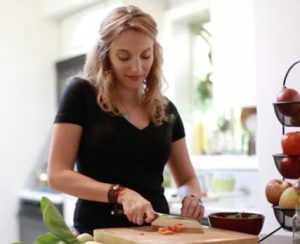 Lauren’s program didn’t just teach me how to eat better but incorporated food/nutrition, career, relationships, spiritual awareness, and physical activity. I was able to get way more comfortable being in the kitchen. Lauren helped turn cooking into fun, instead of stressful.